The past month has unleashed what seems to be a startling increase in natural and manmade disasters – hurricanes, earthquakes, floods, and violence. Bringing healing to people in crisis is core to who we are as an organization. It compels us to act, and to prayerfully consider where Medical Teams can help most – where the health needs are greatest, where we can gain access to those in need, and where we have the resources to respond. When back-to-back hurricanes slammed our neighbors in the south, we were deeply moved by the passion of our dedicated supporters, who reached out eager to help send vital hygiene supplies to evacuees. 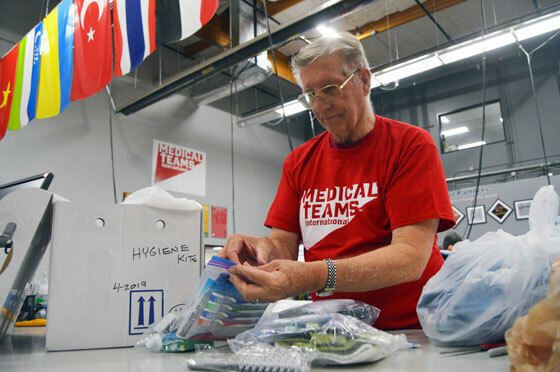 Faithful volunteers pack Hygiene Kits after Hurricane Harvey. In just a few short days we were able to package 2,000 hygiene kits to send to people displaced by Hurricane Harvey in Texas. We also partnered with an organization on the ground to meet health and hygiene needs in Florida and Georgia after Hurricane Irma. Thank you for coming alongside us to provide comfort and care to our neighbors across the country. Hurricane Maria devastated Puerto Rico in mid-September, leaving the island ravaged and without power. As resources are rapidly becoming depleted, and people struggle to find basic necessities, there is a request for aid from the mainland U.S. To help our neighbors through this time of crisis, we are providing medical and health supplies as well as hygiene kits to those in need through a trusted partner. Two earthquakes in Mexico destroyed buildings and claimed many lives. In this case, we evaluated the opportunity to respond using our standard criteria: need, access, and resources. While the needs are great, there are already many governmental and non-governmental organizations deeply involved in responding, including in the health sector. We determined that our resources, therefore, would be put to better use elsewhere, in a crisis where health needs are overwhelming the local capacity to respond. In less than a month, the displacement of Rohingya people from Myanmar has quickly risen to become an urgent humanitarian crisis. In informal settlements, some 400,000 refugees lack clean water, sanitation, and shelter, making it likely that disease could spread and threaten thousands of lives. The needs are massive and immediate, and they are not being adequately met by governments or humanitarian players. Working in close coordination with the United Nations (UN) and with partners on the ground, we’ve determined that Medical Teams can have a significant impact in helping save lives in the midst of the Rohingya crisis. Our hearts are deeply grieved by the images we’ve seen and the stories we’ve heard coming out of Bangladesh. Our Humanitarian Response team has been on the ground in Cox’s Bazar–where most of the Rohingya refugees have fled–for over a week. Our initial efforts will center on providing direct health care and preventing disease outbreaks. We will also serve as a vital link between the critically ill and their access to urgent care—helping refer patients who need extra care to nearby healthcare facilities. Please join us in praying for all those around the world who are suffering in the midst of disaster. And pray especially for the displaced Rohingya in Bangladesh—that they receive the care and comfort they need in the aftermath of tragedy.